The air is clear and slightly cold, just chill enough to notice. A layer of glittery dew covers the grass. I stand on the back porch my eyes closed, face to the rising October sun. I feel a slight warmth on my eyelids and this makes me smile. The birds are in riotous glory; I listen to their songs intently; trying to make out as many distinct songs as I can. I recognize the song of the chickadees accompanied by the expectant cluck of the chickens next door. I hear the caws of the crows in the distance; calling to each other from neighboring trees. 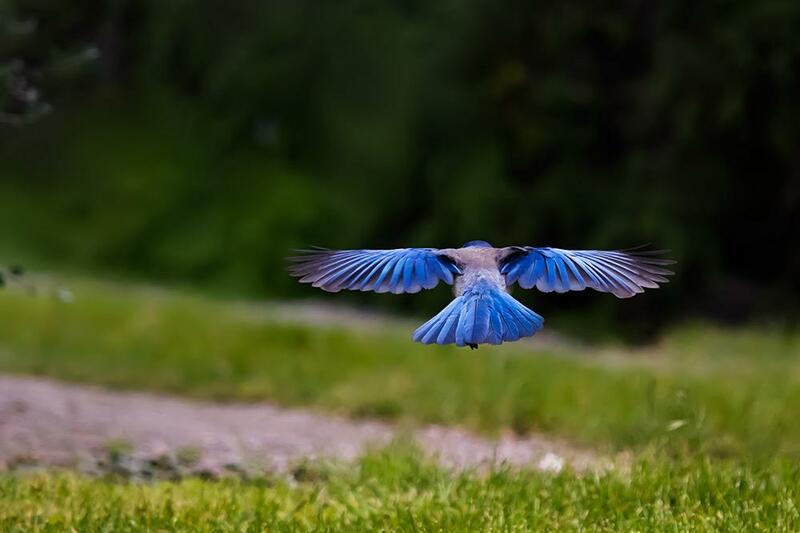 At once they all take flight, flying high into the deep blue sky circling the tall pines and calling out to each other. I can feel their hurried energy as I do the squirrel’s. I think I hear one rustling in the large bush in the back, or at least what I presume is a squirrel. My imagination comes up with ” interesting scenarios” as to the identity of this “mysterious” creature when Jay, the Scrub Jay, bursts out of the very same bush and scares the zen-like serenity right out of me. He lets out a distinctive SQUAWK, swoops down across the yard in perfect form and lands right on top of the roof. A-ha! He then spots the peanuts “some kind human” has set out. I watch with delight as he goes from the roof down to the top of the fence. 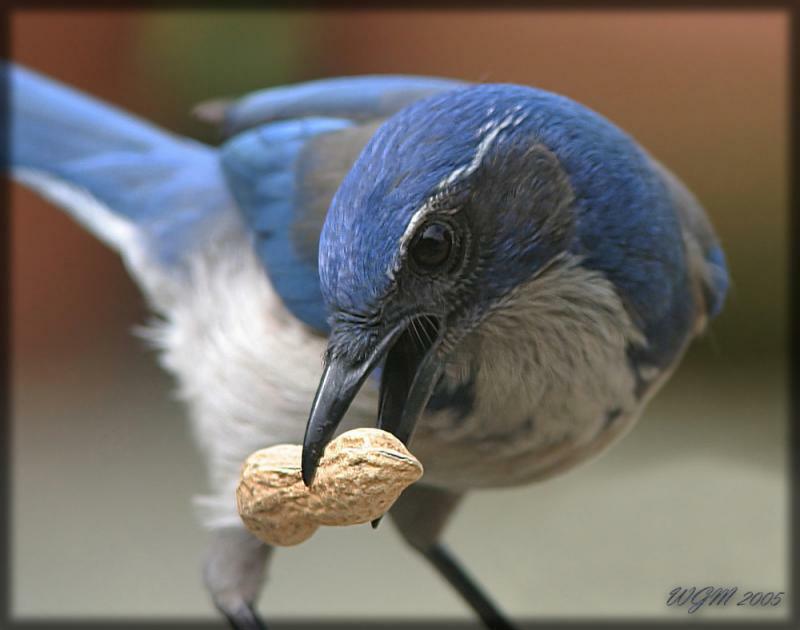 He picks up a nut in his beak, tips his head back, the nut rolls into place and then he’s off with his prize…off to one of a half-a-dozen stash places located in the surrounding tree canopy. Every time he dives down he squawks and this sound reverberates all over. I watch as he checks the ground for any missing nuts. He lets out one last flurry of distinctive calls then takes off somewhere beyond the neighbors Maple tree. My listening has not ended as I try to make out as many sounds as I can; city intertwined with nature. The purr of lawn mower and the edgy beep beep of traffic noise and mixes with the sweet innocence of birds. I hear the other neighbors goat, yes goat. A child’s laugh is drowned out by the roar of a jet engine high in the sky, leaving a white trail behind it. 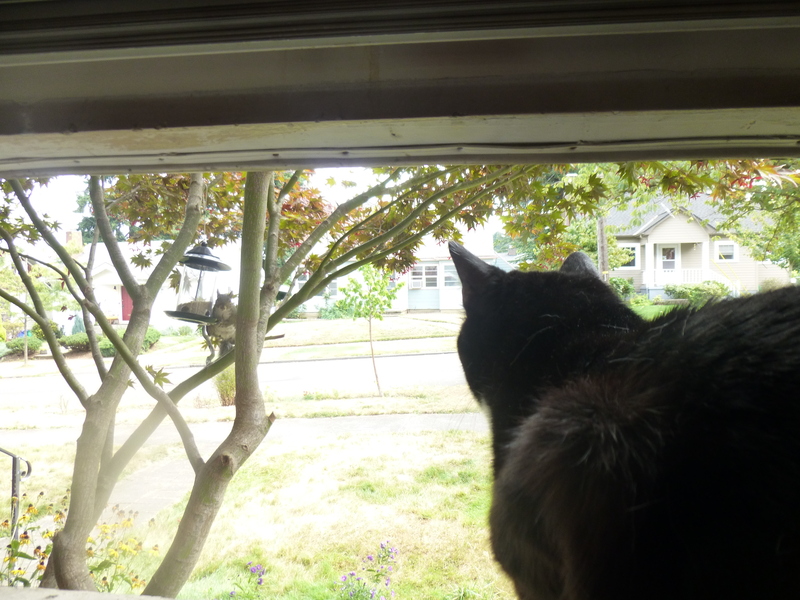 I am distracted once again, this time by a real squirrel. It has come to the fence and found the nuts gone. Again, taken by that dashing blue bandit. The squirrel scolds me; staring at me and barking. Its fluffy tail adding to the drama, twitching and and going in circular motions. I laugh knowing it will soon be checking the bird feeder out front and gorging itself on mixed seeds. All the while eyeing me out of the corner of its eye. 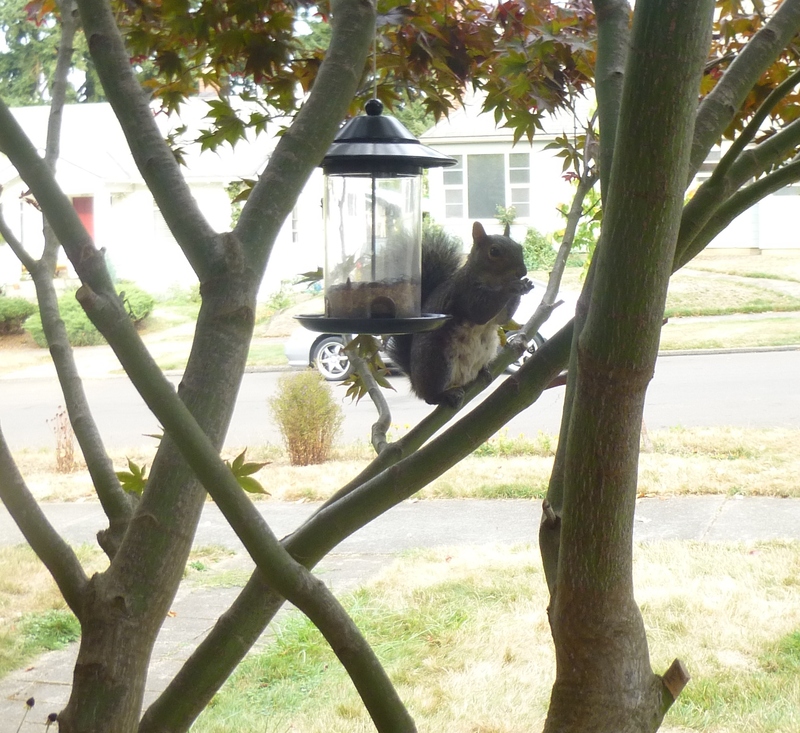 Jerome the squirrel, resident bird feeder raider and scold. This is a spectacular time of the year. The exquisiteness of the season deepens with every passing day. I feel intoxicated with the thrill of life as I live from moment to moment each changing from one to another like the seasons, deepening and becoming more and more beautiful. The ground we walk on, the plants and creatures, the clouds above constantly dissolving into new formations – each gift of nature possessing its own radiant energy, bound together by cosmic harmony. There is a lake about a half mile from me where I often go walking. The squirrels there are the friendliest ever, making it so much fun to feed them. Aah, I loved this post Nancy! Happy birthday, by the way! 😉 I think we have similar creatures in our gardens, but your jays are much prettier than the European ones. Do you ever see or hear woodpeckers too? We have lots and they laugh a bit like the jays. Enjoy the season and have a wonderful week! Hello Cathy! Thanks so much for the birthday greeting. YOU remembered! 😀 I do hear the odd woodpecker around here. Especially up at the botanical garden near my house. It is such a lovely time of year! You have a wonderful week as well. I loved spending time in your yard with you. You painterdsuch a delightful visual and auditory picture of being there with you.